A Veterinary Surgeon is always on call to attend to genuine out-of-hours emergencies. Telephone the usual number and your call will be answered by a message handling service who will then page the vet on duty. Please do not call the out of hours service for non urgent cases or for general enquiries. Our out -of -hours service is provided for our registered clients only. Clients of other practices will be directed to the out of hours provider nominated by their regular practice. Cost of our emergency out of hours appointments FROM £165 . The Duty Veterinary Surgeon will arrange to see your pet if necessary and advise you of which of our two surgeries to attend. We operate our own emergency service from our own practice by our own vets and nurses - you will never be asked to travel to another practice for veterinary attention out of hours. 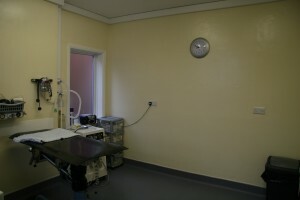 We also have the ability and facilities to hospitalise sick or injured animals overnight which are cared for and monitored by our duty vet and nurse, meaning that your pet does not have to be transferred back and forth to an "Out Of Hours" provider to be monitored overnight when he or she is sick or has had surgery. We can also provide round the clock 24hour nurse monitoring . For general advice and queries and to make appointments please telephone only during office hours.